The Rosendale Theatre will present the acclaimed documentary film Symphony of the Soil on Wednesday, May 29 at 7:15PM. The screening will be followed by a Skype Q & A with Writer/Director Deborah Koons Garcia. The trailer is terrific–watch it here. Symphony of the Soil blends ancient knowledge and cutting edge science to explore the complexity and mystery of the ground beneath our feet. Civilization depends–and always has–on the abundance of healthy soil, teeming with nutrients and life. The fascinating dynamics of soil, water, the atmosphere, plants and animals are brought to life as the film examines our human relationship with soil, and the devastating cycle of fertilizer/herbicide over-use. We see the promise of large-scale composting, and understand soil’s key role in ameliorating the most challenging environmental issues of our time. Symphony of the Soil features on-location “working” interviews with esteemed scientists and visionary farmers and ranchers, including Ignacio Chapela, Josh Frye, Elizabeth Kaiser and the remarkable physicist Vandana Shiva. Deborah Koons Garcia is the acclaimed Director of The Future of Food (2004), the first major film to cover the history and technology of genetic engineering. 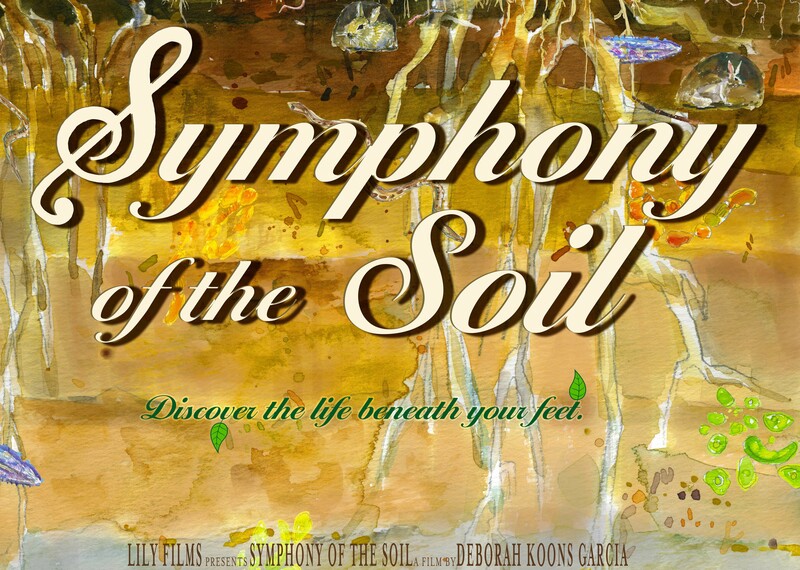 Symphony of the Soil was completed in 2012 and has been featured at film festivals and conferences around the globe. This screening of Symphony of the Soil is sponsored by the Rosendale Environmental Commission. It continues the Rosendale Theatre’s strong commitment to presenting films of significance in the realm of environment and health. A writer since I learned to hold a pencil (no, not like that...hold it like this!). Long-time writer/producer for television, now organizer of Repairs Cafes in the Hudson Valley (13 & counting!) -- Program Manager of Solarize Hudson Valley, non-profit, state supported, community sponsored renewable energy program. We're all re-inventing ourselves. It's a sci-fi world, isn't it? This entry was posted in Climate change + Culture, Deep Ecology, John Wackman blog and tagged Agriculture, Deborah Koons Garcia, Future of Food, Ignacio Chapela, Rosendale Environmental Commission, Rosendale Theatre, Soil, Symphony of the Soil, Vandana Shiva. Bookmark the permalink.